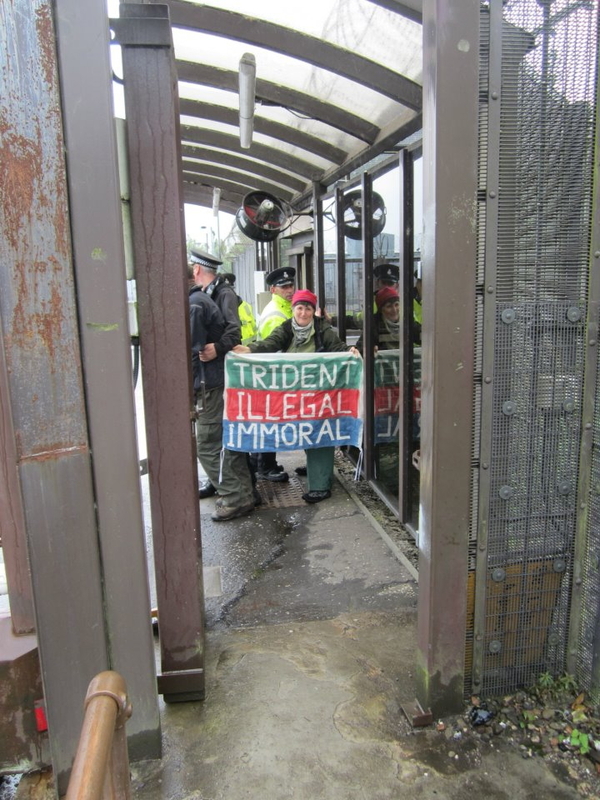 Seven activists from Faslane Peace Camp and Trident Ploughshares entered Faslane naval base this morning with four members of the group slipping past guards and reaching points up to 100 yards inside the base. A further two were arrested in the attempt. 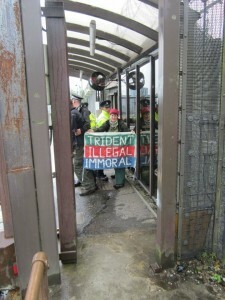 At 7 a.m. on July 2, Faslane Peace Camp and Trident Ploughshares activists attended the North gate of the Faslane Naval Base to serenade the approaching morning shift staff with peace and nuclear disarmament songs. The act doubled as a ruse to enable fifteen of the group to attempt entering the base. One TP activist, Brian Larkin, succeeded in gaining entry to the base whilst the rest were prevented from doing so by Ministry of Defence and Strathclyde police. In a show of the same relentless persistence that has kept the Peace Camp and the anti-nuclear movement going over the years, the group later returned to make a second attempt at breaching the North Gate. Two were arrested during the attempt whilst six gained entry, four of which reaching up to 100 yards inside the base. The bandit alarm was activated and the Naval Base was locked down, preventing traffic from entering the base and normal operations to continue within the base for 45 minutes. The action was part of the Peace Camp’s 30 Days of Action marking 30 years of continuous resistance to nuclear weapons at Faslane. Thirty people have been arrested in the campaign which began on 9 June. Nine people were arrested today. Each of those trespassing were carrying letters explaining the international illegality of nuclear weapons to present to workers inside the base. In 1996, the International Court of Justice wrote the advisory opinion that not only would the use of nuclear weapons be illegal but the very threat of use through deployment, maintenance and upgrade of nuclear weapons systems is in contravention to the Nuclear Non-Proliferation Treaty. Under the terms of the NPT which entered into force over forty years ago, the UK government is obligated to bring nuclear disarmament to completion. Instead the UK government has continued to maintain and is now upgrading its nuclear weapons system. The recent news that the MoD has awarded lucrative contracts to arms companies for the initial stages of a Trident replacement programme furthers this ongoing mockery of our international legal obligations. As long as our government continues to fail in it’s obligation to make serious moves toward complete nuclear disarmament, members of Trident Plougshares and Faslane Peace Camp are committed to non-violent direct action to disrupt the deployment of these illegal and immoral weapons. Further demonstrations are planned for the remainder of the thirty days of action which will finish on July 9th. Amongst other actions, there will be an academic seminar blockade on Friday and a Rebel Clown Army insurgence on Saturday. For more information on the 30Days Action Campaign contact the camp via faslane30@gmail.com.